Kano Nigeria – Boko Haram fighters hacked to death 10 people in a remote village in northeast Nigeria, a local government official told AFP. Maina Ularamu, local government chairman of Madagali, in the north of Adamawa state, said the attack happened early on Friday morning in Pambula-Kwamda village. 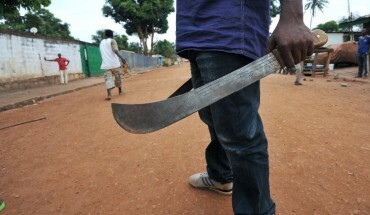 “The attackers went into the village around 4:00 am (0300 GMT) while residents were still asleep and used machetes to attack their victims,” he added. News of the attack only emerged on Monday because of the remote location and communications difficulties caused by the insurgency. The attack is the latest by Boko Haram in northern Adamawa state, which was declared “clear” of insurgents in March by the military. A number of villages in the area have been hit as troops try to flush out rebels from their Sambisa Forest stronghold, just across the border in neighbouring Borno state. Soldiers have in recent weeks rescued hundreds of women and children from the forest after they were kidnapped during Boko Haram raids. On Sunday, 31 people — most of them children under 12 — who were freed last week were brought to the Malkohi camp outside the northeastern city of Yola, relief officials said. On Monday, defence spokesman Chris Olukolade said troops had thwarted an attack on Mafa, 50 kilometres (30 miles) east of the Borno state capital, Maiduguri. About 30 Boko Haram fighters were killed and “many others” wounded, he added in a statement.